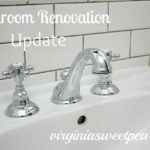 At the end of July I gave an update on our main bath renovation that included gray paint, a new shower curtain, and a grout refresh. 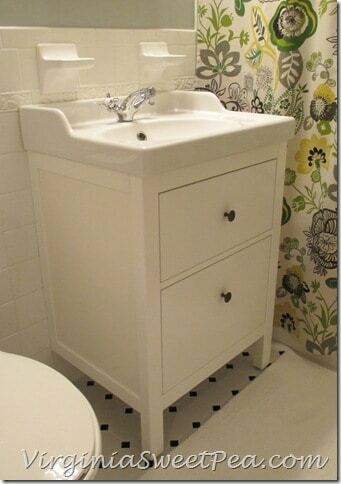 Next on our renovation list was replacing the pedestal sink with a vanity that would give us much needed storage. We found a vanity locally that we loved but it was above our budget. Luckily, on the way home from Haven, we stopped at IKEA to simply look around. However, we soon realized that they had a bathroom vanity that we considered perfect for our remodel project. 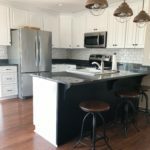 We purchased a Hemnes sink cabinet with two drawers, a Rattviken sink, and a Apelskar faucet all from the IKEA store in Charlotte, NC. 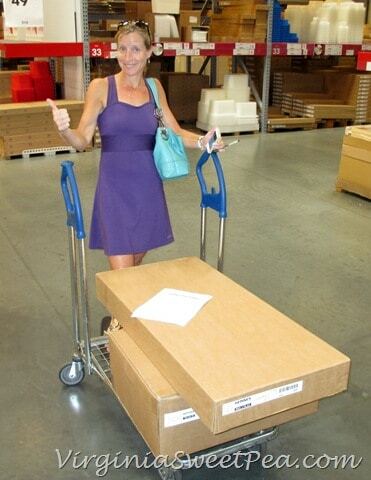 We both were thrilled to get exactly what we needed at a reasonable price. Take it away, Mr. SP! The bathroom vanity/sink/faucet combination is essentially cafeteria style – you can choose each of the three components individually. The vanity comes in various styles, colors and sizes. Similarly, you can chose the sink in various styles and sizes. Finally, there were numerous choices of bathroom faucets from which to chose that are appropriate for the sink choices. The cabinet was in a single, well packed box. I quickly inventoried all the pieces and found that it was all there. The hardware and some unique tools were also included in the hardware kit. The instructions had essentially no text, but only cartoons. That proved sufficient as the instructions were well done and the kit was easily constructed. 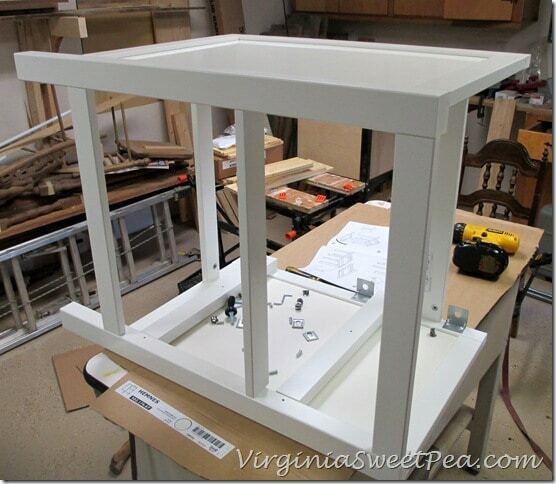 Below are photos of the various, simple steps in the construction of the cabinet. It went together very easily and was of very good construction. I thought that I would have to glue some pieces together, but everything fit so well and tight, that I found that unnecessary. 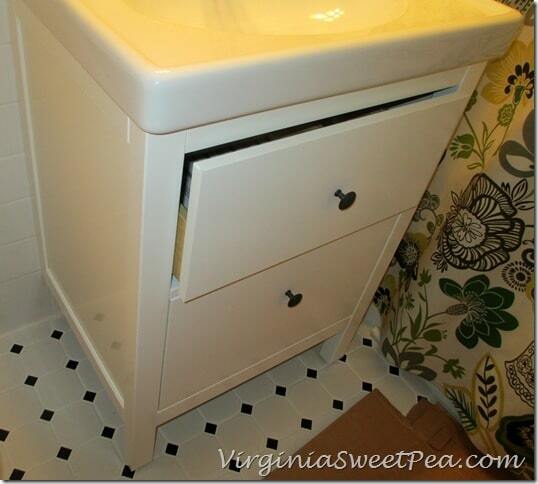 Once together, the cabinet was brought into the bathroom and positioned in place. 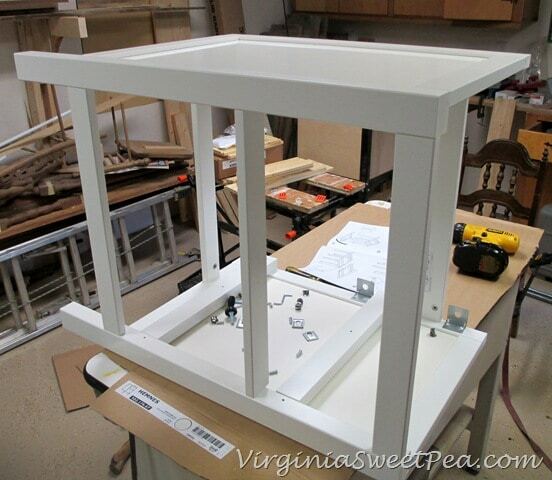 The cabinet was leveled using screw feet on the bottom of the front legs (no rear legs on this cabinet, making it necessary to mount to the wall). Marks were drawn on the walls where anchors would be placed to hold the cabinet in place. I scored the tile, then used a masonry bit to drill 5/8” holes in the wall to mount the anchors. I was fortunate enough to hit wood behind the wall, so lag screws were used to screw the cabinet to the wall. 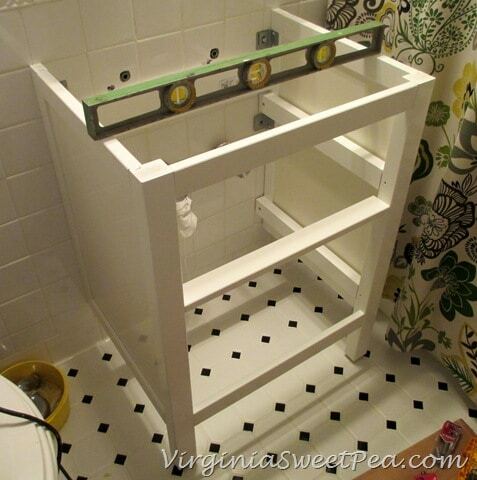 Once mounted to the wall, the sink was fastened to the wall and cabinet using silicon adhesive. I let this dry overnight. I was willing to quit at this time anyway because plumbing came next, and I was more than willing to procrastinate. All the plumbing came with the sink. This is important because special plumbing is necessary to make the necessary space for the cabinet drawers (more on this later). The plumbing all went together easily – until I had to connect the 1-1/4” drain pipe to the wall 1-1/2” wall pipe. All that was needed was a conversion kit (about $1.50), but the big box hardware stores did not have it. It was both laughable and frustrating to listen to the employees in those big box stores guessing and debating as to what I needed. I went to the small, local True-Value store in desperation, and they had exactly what I needed. I now know to go there first. Going to the locally owned store should have been my first choice anyway. I have always been pleased with my transactions there. 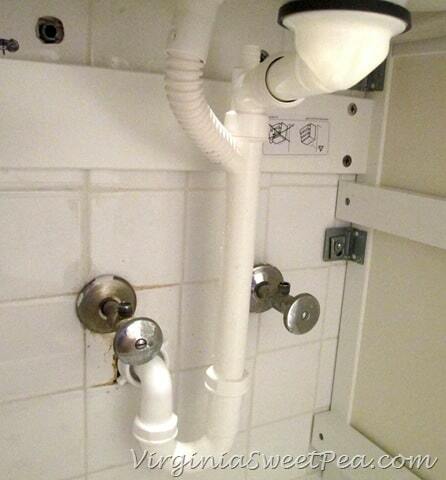 Once I had this part, the plumbing was completed quickly and easily. I was as efficient as I could have been with plumbing to maximize the space (again, more on this later – suspenseful, right?). I unpacked the funky new faucet that we had chosen, and put that in quickly. It also came with all the necessary parts, and a unique tool to help installation. 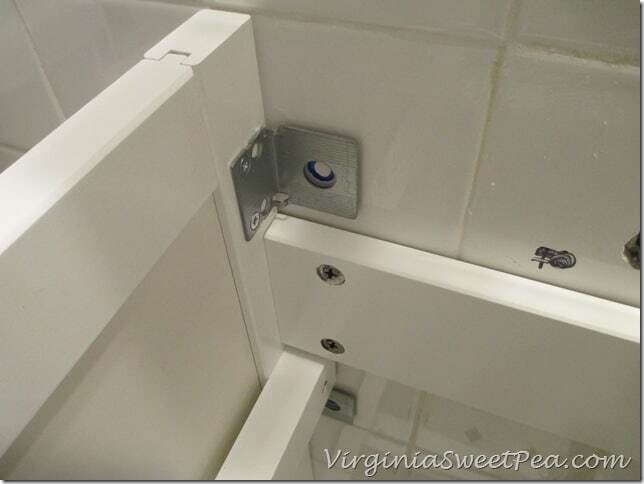 Again, I am impressed with the user friendliness of the IKEA products. Once connected to the water source, the faucet was tested, and the entire system check for leaks. There were none. Finally, it was time place the drawers on the drawer slides provided in the kit. They are really well designed, and beefy. The drawers fit into them well, and locked into place. The bottom drawer closed easily, and completely. However, the top drawer closed to within 1/2” of complete. The drawer back hit on the overflow drain pipe from the sink. This is somewhat distressing, as I was as efficient with the plumbing as I believe I could have been. A possible solution to the problem was cutting a notch, and shortening the top drawer slightly where it interferes with the drain. Instead, I moved one side of the drawer back in a few inches to accommodate the plumbing. 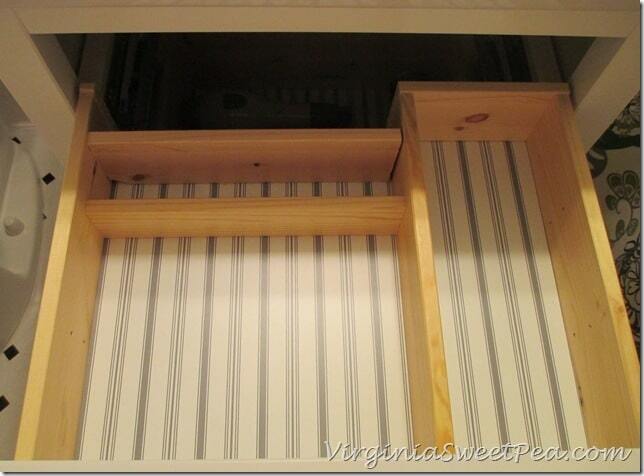 Once completed, the drawers fit well within the cabinet. Overall, we are very pleased with the end result, and impressed with the overall layout and simplicity of the kit. The only two detriments that I can note are, 1) the necessary purchase of the pipe conversion (this is minor), and 2) the interference of the drawer with the drain pipe – this is unfortunate as IKEA could have made the top drawer 1” shorter and removed such tight tolerances in the plumbing layout. 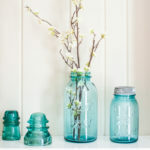 Again, it is worth noting that we are completely pleased with the end product and feel that the value, style are superb. Thanks to my handy husband for installing our new vanity. 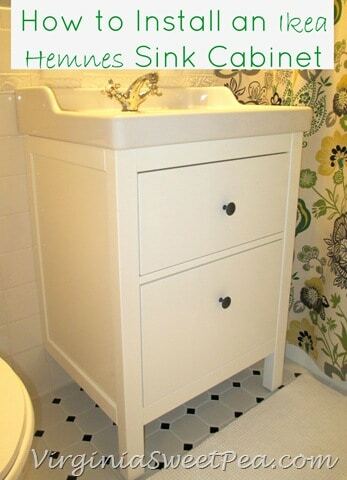 I have not lived in a home with drawers in the bathroom since I was a teenager. I am so excited to take advantage of our new storage space. What’s next for this space? We have a large mirror on order and art is needed to brighten the wall space. Wow Paula, it looks GREAT! Mr. SP sure is handy, and good at writing “how to’s”…could blogging be in his future? I still haven’t been to IKEA…gotta go! I am impressed by your skills! Great job. I really like that vanity. I also really love it when my hubby just takes over a project and gets it done. So nice! Thanks, Kathleen. I wanted to work on this along with him so that I can learn how to do it myself but it certainly goes faster when he does it alone! Thanks, Marty. It’s so nice to finally have storage. I LOVE THIS! It looks fabulous, and I doesn’t look too intimidating. Thanks for sharing. Love that sink, it looks fabulous!! My girlfriend and I ran into the same issue withthe drain. Instead of cutting the drawer I used a heat gun to melt the so called flex pipe. If you use this method be careful cause you can melt a hole through the pipe. 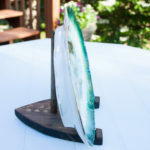 If you don’t have a heat gun a hair dryer on high heat with a low blower will work. Thanks for the tip, Jonathan. Hopefully you will save someone else the hassle of having to alter the drawer. Wow, I’m impressed! Seriously, you did a great job. Love it. Thank you for joining us on Let’s Get Social Sunday. New follower. I really love how this turned out! We have a couple of things from the Hemnes line and I love them. 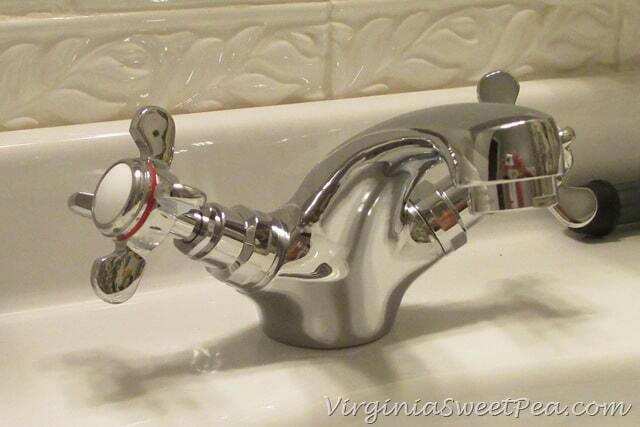 I also love the faucet you selected! Great job! Thank you! We loved both the cabinet and faucet as soon as we saw them. perfect, looks like it was made just for that space! Thank you! I am enjoying both the counter and storage space. So pretty! I have to admit…I would have been freaked out by taking on this project, but looks like you handled it like a pro. So cool! It looks easy enough to do. Pinned! Thanks, Tonia. It really wasn’t difficult if you have basic woodworking skills. My husband was there helping me along! Never in a million years could we have done that! This looks great! Thanks so much for all the details. You are too awesome! Enjoy your new found drawer space! I love your shower curtain, by the way! Thank you! I fell in love with the fabric the second I saw it. Hi Paola. All looks great. I have a question. Are you satisfied with the sink since it’s too shallow? 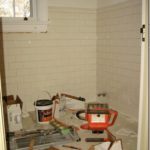 Do you think you will have a problem with water coming out of sink and damage the cabinet? I just bought this same vanity and sink. Do you know what toilets will match this Ikea product? Have written to Ikea and Koehler but no answer yet. You know how whites can be so different. We have an American Standard Cadet from Lowes that matches the sink very well. Quick question. My husband and I just bought the same sink and drawers and can’t find the new plastic drain it was supposed to come with (the new plumbing stuff you have in one of your pics. The white tube that connects to the water source). 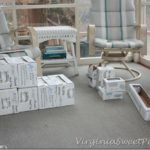 Do you remember which box it came in, drawers or sink top? Did it have its own box? We can’t remember which box it came in. I’m so sorry, I wish I could be of help to you. Great job! 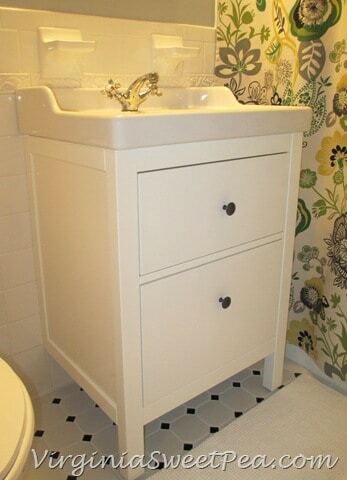 We are considering this vanity/sink and are wondering if you were able to secure all four of the anchors into studs. Also LOVE your shower curtain, any chance you will spill the beans on where to find it? Thanks so much for your kind compliment. 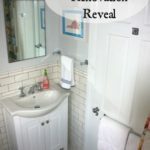 I made my shower curtain and purchased the fabric from fabric.com . 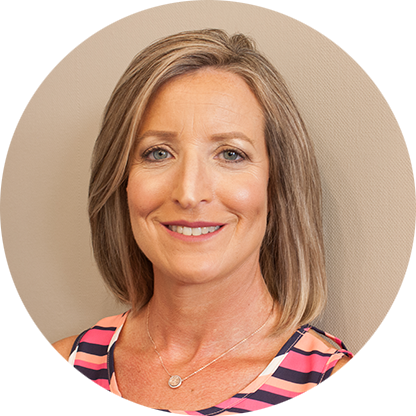 Kristen – I’m glad we were able to help you out. We love our sink and hope you like yours, too! We are about to redo our bath, and I am seriously considering the Hemnes cabinets. 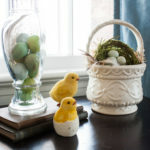 I did not see the white ones displayed last time we were in the store, and am wondering about the finish. Is it mat or is it the glossy variety they used to have on the white bedroom series? Also, which parts are made of particleboard – the side panels and drawer bottoms only, or is there something else that’s not just wood? The website description is not clear on that. We had problems with mold in the bathroom, and not sure if the vent we need to install will solve all the problems with condensation… Are you happy with how the cabinet performs with moisture? Martyna – The finish on the cabinet is glossy. I’m not sure which parts are particle board. 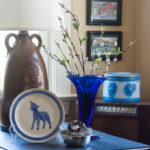 I will say that my husband is very picky about quality and he was pleased with the cabinet. 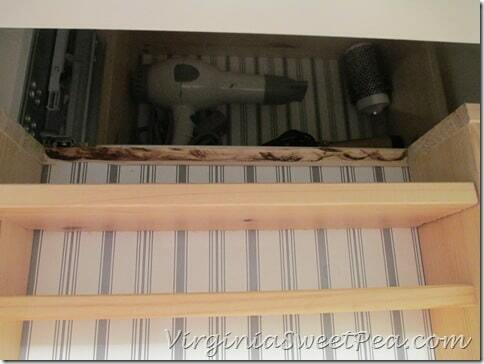 Our cabinet has performed fine with moisure from showers but we do have a good vent. I’m happy our post was of help to you! Thank you for replying so fast. Glossy sounds good! We don’t have a fan in out bathroom! Amazing… There is a window, which I think according to the code is enough ventilation to skip the fan, but the window had to be painted shut years ago. I do not think we’ll have to much moisture problems after we get the extra ventilation (and I plan on the fattest vent I can find and afford), but I just don’t like the idea of MDF anywhere close to water. 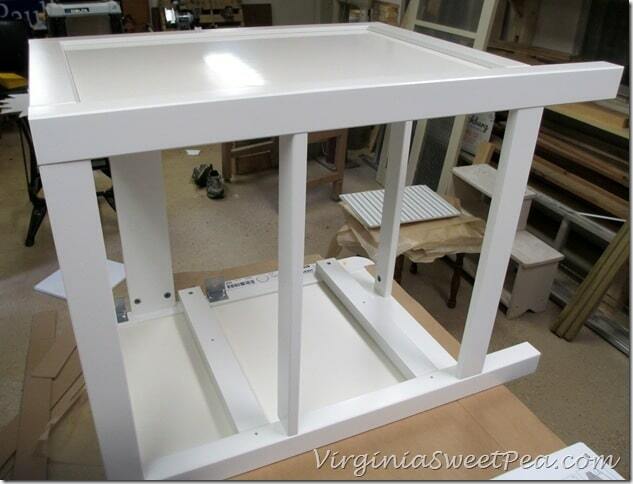 Looking at your pictures, tho, it seems like most of the vanity is pine, and what is not, I can either prime and paint (drawer bottom), or is already painted (the side panels’ inserts). Love your choices! I think of all the pictures I’ve seen of bathrooms with the Hemnes vanity, your decorating scheme is the best. I love how the touches of dark in the floor and the shower curtain bring out the knobs on the vanity. Most people seem to forget that the Hemnes knobs need to be echoed somewhere in the space as they are such a high contrast…one of the features that I think makes the vanity so charming. After seeing your bathroom I will definitely incorporate touches of dark in the decor when I use my Hemnes in our remodel. Beautiful! I was thinking about using this as a nightstand on each side of the bed. 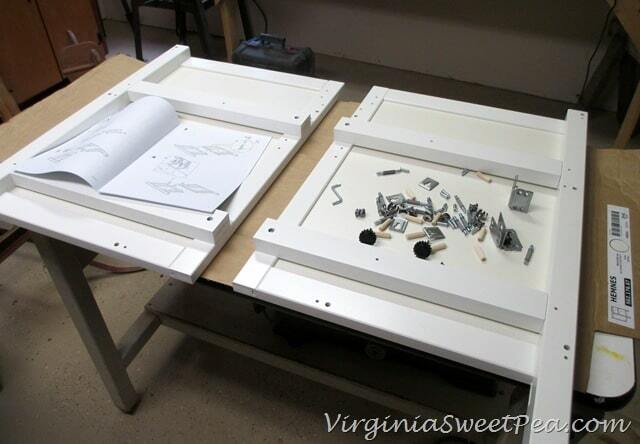 The dimensions would work a lot better than any of the normal Hemnes bedroom line dressers. I of course would need to add a top to make it functional. Are both drawers full depth? The drawers are full depth. Hi Paula, I am just about to install this vanity in our rental unit, and they layout of our bathroom looks identical to yours! I do have a question that someone asked earlier but it doesn’t look like there was ever an answer! Are you happy with the depth of the sink bowl? It is half the depth of a standard sink bowl and I am concerned that water will splash out of the bowl and all over the cabinet, etc. I do see that this particular sink has a backsplash so that probably helps. but, i was thinking of buying the style without the backsplash. Have you experienced any issues with the water flow into this sink? And how has this vanity and sink held out for you over the last year? Thanks! Thank you so much for these instructions. We are installing the same Ikea Rinnnen system. Need to pick up the conversion kit. I have a question. My question is that the Ikea drain pipe that came is about 16″ long. Yours seems to be sticking out of the wall for only a couple of inches. We would like to accomplish the same thing. Did you have to cut it and if so how much and how much did the drain pipe go into the wall pipe? We are thinking about purchasing the same sink & vanity combo. I noticed in your photos that there is an accordion hose involved in this set up. Does that hose get moldy? Our laundry accordion hoses always did, so we had to stop using them. 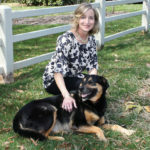 I would love to hear if this has been an issue for you! We have had no trouble with mold, Tiffany. I have a mold problem from the accordion hose. I put baking soda and white vinegar in the drain often but it doesn’t completely fix the problem. Otherwise the sink is fine. I am so glad that we were able to help you. We’ve been using our sink and vanity for over a year and have been 100% pleased with it. I recently bought this sink/cabinet, and the drain parts seem to be different. The diameter of the down tube, p-trap and horizontal drain tube are all 1.5″. You stated that your drain tubes were 1.25″. Can you confirm that your parts are 1.25″? 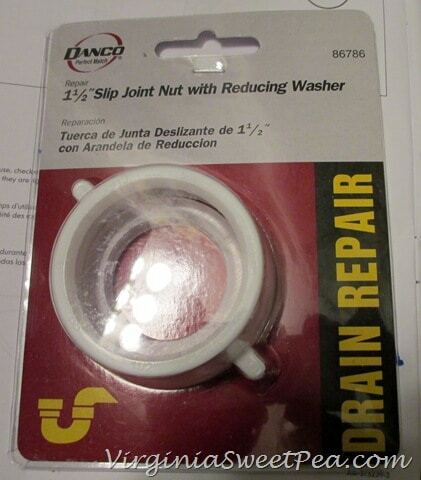 I’m trying to see if I can order a similar drain kit as we have a 1.25″ wall fitting (old house), and IKEA claims there is no alternate part number. But the customer service rep obviously knows nothing of plumbing, so I’m trying to get him to find an expert. I could use a coupling to reduce the line size, but if I put it at the wall to use all the IKEA parts, it would push the drain out from the wall by 1.5-2 inches at a guess. Which of course would mean having to shorten the upper drawer significantly. Otherwise I would have to reduce on the down tube, but then have to replace the p-trap and horizontal tube as well. Not expensive, but I worry about leaks when modifying things and there are reports on the web that the IKEA pipes are actually metric so slightly different diameters than the US equivalent 1.25″ or 1/5″. I double checked the plumbing supplied with our sink. All the plumbing is 1.25″. 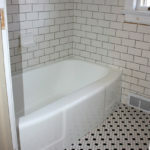 We also have an old house with 1.25″ drains, which made the plumbing relatively easy. The only complication, is that installation interfered with the drawers – something of which you are already aware. Thanks for checking, they have changed the design to 1.5″, probably to be more similar to current US standards. I did try to order the older parts from IKEA, and lets just say their parts strategy leaves a bit to be desired. They had no information on any design changes, and can’t even order the plumbing kit, much less individual parts, separate from the sink. 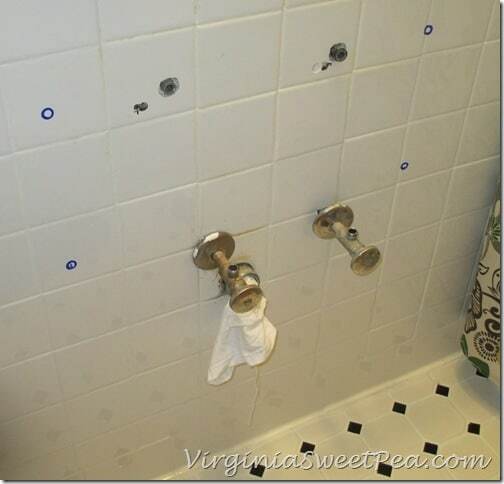 So if you had a part damaged, they have to open up a new sink and rob the plumbing kit. My local plumbing stores were actually useless in finding an adapter. I came up with two options (I can’t seem to post any links). The first is a step down adapter that I can mount at the wall (it seems like I should not loose too much space. 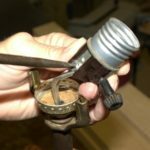 The other would be to use a repair J-bend which has an elbow at the exit rather than just a discharge tube. You could then just use the same reducing washer that you used in your installation and run a 1 1/4 tube to the wall. But that seems like it might be harder to fit close to the wall. Anyway, I appreciate the help, I have to move an electrical outlet up a bit before I can complete the installation. I encountered the 1.5″ IKEA plumbing vs my 1.25″ wall fitting as well, and was able to use an expensive adapter without problem. Just wanted to share in case anyone else is reading these comments and is in the same boat. Thanks, by the way, for this very helpful blog post! It gave me the confidence to tackle this project myself. Oops, correction: an *inexpensive* adapter. Just a couple bucks! Congrats to both of you. I was looking at the same item here in Australia and wondering how the top drawer could close given the need for an S bend under the sink. It is reassuring to know that the item is of good quality and your description encourages me to tackle the assembly myself. Thank you for such a useful and well written post! 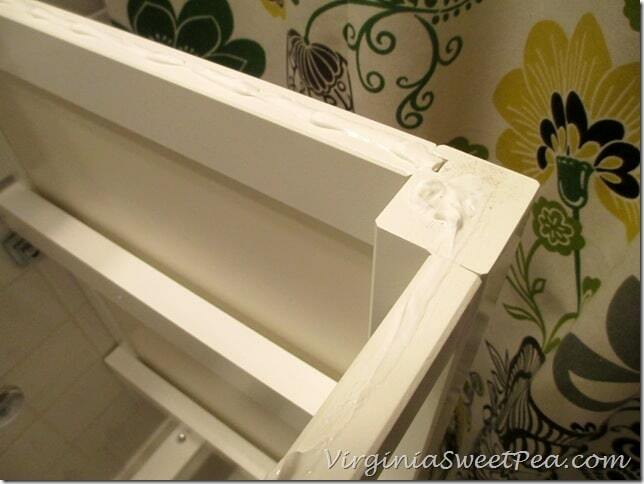 We were just at IKEA yesterday looking at this exact vanity but I was worried about the finish of the vanity itself. Has it held up to water and all that comes with being in a bathroom? 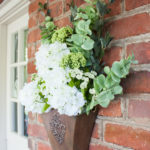 It is such a wonderful style! This vanity has been wonderful and still looks like new. I wouldn’t hesitate to recommend it to you. I just finished installing the 40.5 inch HEMNES / RÄTTVIKEN Sink cabinet, and its corresponding vanity in the bathroom for my two youngest boys. 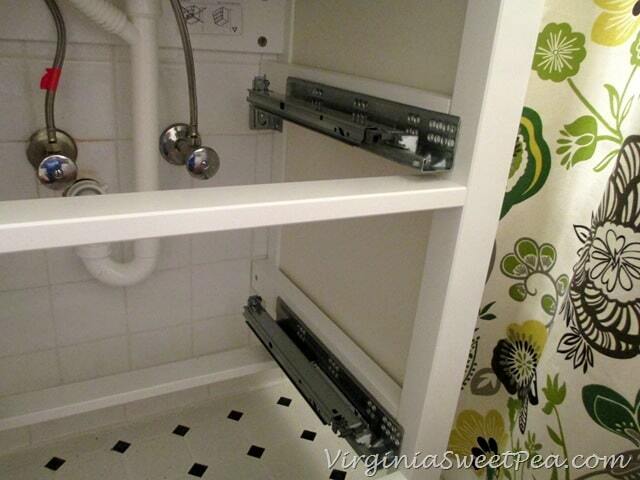 Rather than modify the cabinet drawers to fit around the plumbing, I modified the plumbing to allow the drawers to operate freely. This essentially involved securing the hot/cold water supplies (turn on faucets in the rest of the house to evacuate any water remaining in the pipes, and you will still need to place something under the pipes to catch some water when you start working on them), cutting the copper pipes down to about an inch and a half from the wall and then installing Quarter-Turn Angle Valves (Keeney Mfg. Co. Model #: K2626PCLF) so that no part of the valve extends beyond 4 inches from the wall (That’s how much space is between the back side of the drawers and the wall. I used about 3.5 inches.) I also had to cut the PVC pipe to about an inch from the wall to create the necessary room. The area of the wall that the pipes in my bathroom go into isn’t nearly as nice looking as your wall, but I was lazy since nobody should really be able to see it. Additionally, my cabinet is up against dry-wall. I could only get one side of the cabinet to align with a stud, so you end up using a dry-wall anchor for the other side. I don’t trust dry-wall anchors to hold much weight. I would suggest looking into using one of IKEA’s SEKTION suspension rails to attach the cabinet and/or vanity to the wall. There is room for it to work, you just need to install the bracket (step 4) so that the back holes of the bracket are aligned with the screw holes farthest from the wall. 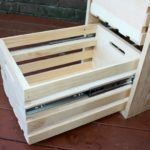 Was it easy to modify the drawer? My husband and I are thinking of getting this cabinet, but I am wondering if it is too much of a hassle to go through that part. It was easy to modify, Mariana. Go for it! We’ve been 100% pleased with this Ikea piece. Very cute! I saw this sink on a recent visit to Ikea and it is perfect for what I want–has the backsplash. I am wondering if I could add 2 back feet so that I wouldn’t have to attach it to the wall? Not really sure if I would have to attach it anyway or not. I have also seen this cabinet customized with detailed trim and paint, which is totally a great idea too. I just finished installing our vanity this week. My experience was different than your husband. My top drawer was fine but my bottom drawer just barely hit the the last screw ring. Luckily I was able to get some zip ties and was able to pull it back just a hair and zipped the ties behind the water valve area. We are pretty happy with the vanity. It is good for the price and the area we live in space is in demand since majority of the homes are townhouses in our city. I love the vanity! I just had it installed a few days ago. I too have difficulty with the drawers hittinh the pipes, however i haven’t the drawer runners yet. The installation guide did not address their installation and my plumber threw out the screws for them. I can figure out where to attach them from your photos but where do I put the screws? And how many do I need? I realize that you did this project many years ago and I don’t know if you even check this space anymore but I figured I would try reaching out. Hello, Ingrid! I am out of town but when I return I will look at the vanity and get back to you. 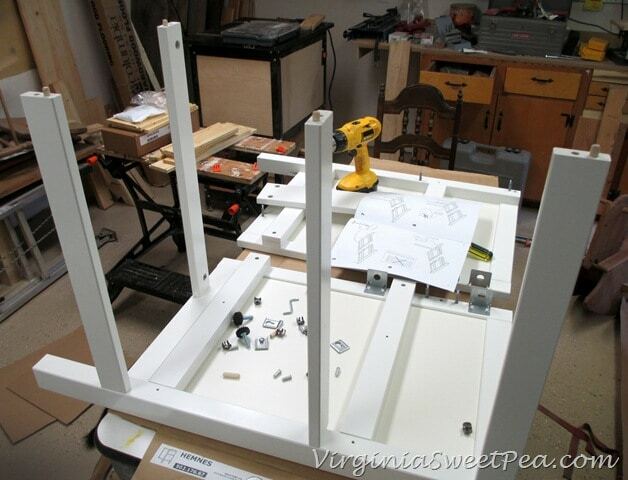 The legs measure 6 1/2″ from the floor to the base of the cabinet. Hey! great post. We had decided on the same vanity but were just at a friend’s where they have a problem with the sink draining properly. She says she brushes her teeth and everything else in the kitchen sink to avoid it clogging. Also, that when unclogged it only stays like that for a month, with very little use. No shaving, no toothpaste, yet it clogs easily. Anyone else had this issue? We have had no trouble at all with our Ikea sink draining.